You asked for this one and we are happy to deliver it. 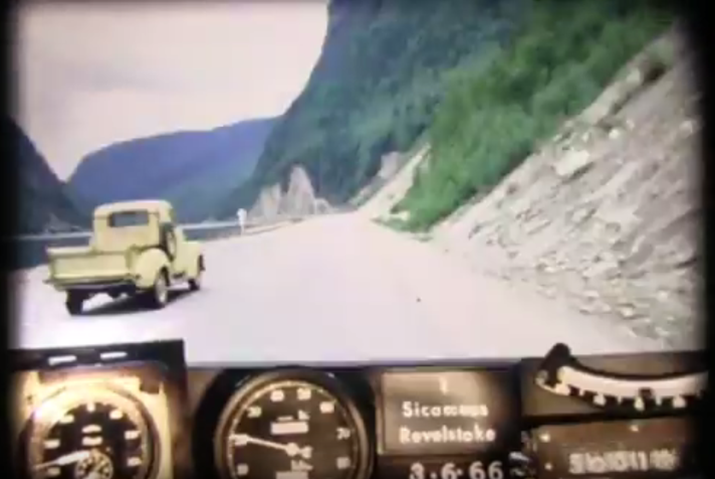 Step back in time with us as we travel BC Highway 1 from Lytton to Revelstoke, circa 1966. This super cool, historical photolog video captures one of the most important transportation routes in BC – the Trans-Canada Highway. It’s the primary east-west route through the province, a big part of our Pacific Gateway program and a vital link between British Columbia and the rest of Canada. We recorded these nostalgic videos from 16mm film footage taken in 1966. The original photologs were collected by rigging a camera onto the dash of a car that took still images every 80 feet or so and then running them all together as a single film. As far as we know, the “Highways Department” (as it was then known) was the first organization in Canada to collect information this way in order to create a visual record of road condition information from across the province, thereby allowing our engineers to study a stretch of road without having to travel there. Pretty cool, eh? Notice some changes along the route today? That’s because we’ve been busy improving the highway as a part of our BC Highway 1 Four-Laning Program. 10.5 kilometres of the highway between Monte Creek and Hoffman’s Bluff have recently been widened to four lanes and the construction through Hoffman’s Bluff continues. Construction will be completed by early fall on the Malakwa Bridge project, east of Sicamous, which involves widening a 2.7 km section of the Trans-Canada Highway to four lanes and replacing the two-lane Malakwa Bridge with a four lane structure. If you’ve been riding along with us, you’ll know we’ve toured the southern stretch of BC Highway 97, from the U.S. Border to Vernon, as well as the northern portion of 97 between Prince George to Dawson Creek and Highway 3A between Nelson and Balfour as it was in 1966. We have also driven over Vancouver Island’s Malahat Highway and along Highway 1 and the original Port Mann Bridge in our BC Road Trip Time Machine travels. Our most recent time machine trip took us from Hope to Lytton and we now are picking up here where we left off. For those BC Road Trip Time Machine keeners out there, you might notice our the date stamp change suddenly on this reel. We can’t say for sure, but it looks like the time machine dashboard cam might have run into some technical difficulties somewhere between Sicamous and Revelstoke. Despite the glitch, it’s a great ride and we hope you enjoy it. Stay tuned for more episodes in your special corner of the province as we work our way through the rest of the 1966 photolog footage. Do you have any questions about this, or any other work we do? Let us know in the comments below or connect with us on Twitter or Facebook. Happy time travels! Great to hear the photolog brought back special memories for you, Barry. Thanks for watching and taking the time to give feedback. Hope you experience many more fun camping road trips! Can you do Courtenay to Campbell river in 1966. My mom Drive Highway 19A in 2016 and it need new paving. Thanks for the reply. The changes to the traffic lights improved things a LITTLE. The City is planning to spend over $1 million which may improve things a LITTLE. I don’t think anyone thinks these changes are anything close to an ideal solution. When the Columbia River Bridge has to be replaced this whole area will have to be ripped apart to allow the new bridge to be constructed alongside the old one. Perhaps something sensible like a grade separated intersection will be built. Oh well, I expect I will be in my grave or a care home by the time that happens (I am the same age as the highway and the Columbia Bridge). I guess after 5 days waiting for approval by the moderator I have to assume my comment is considered politically unacceptable. Not at all Nick, we are just working on getting you the best answer possible. Currently the City of Revelstoke are planning much needed upgrades to the road layout around the Trans-Canada intersection. This is an intersection that is the ONLY access for gas and food on 200 km of highway and it gets horribly busy on long weekends – so much so that flaggers have to be used to prevent it jamming up completely. However it isn’t possible to significantly improve the current mess unless the plans take into account BOTH the highway and the City roads. Although the highway at the intersection has been 4 laned, a mere 300m away the 50+ year old Columbia River bridge is still 2 lanes. The Ministry of Transportation NOW has the opportunity to plan, with the City of Revelstoke, for the much needed upgrading of the Trans-Canada. Unfortunately all the signs are that a failure to plan for the future will continue to leave a legacy of uncoordinated and inadequate failures to fix the problem. Here’s what we heard back about your questions. While the planned Victoria Road intersection upgrades is a municipal project, we can assure you that the City of Revelstoke has been consulting with the ministry and keeping us informed as their project proceeds. In advance of the city’s planned improvements on Victoria Road, the ministry made traffic-flow improvements last year on the Trans-Canada Highway through Revelstoke. We also installed a new traffic light signal-timing system called Automax to improve traffic flow on the Trans-Canada Highway through Revelstoke. This was tested last summer during a highway closure and the traffic cleared out quickly without the need for flaggers. Flaggers have been used to manage the congestion on Victoria Road (exiting on/off to the businesses), which the City’s project aims to address. The ministry also upgraded the Trans-Canada Highway-Victoria Road intersection with a dual left turn lane onto the highway to help reduce congestion. Thanks again for connecting with us here. This was great fun! Downtown Kamloops looks pretty similar, but the rest of the city is very different. No bypass, which I think went in during the early 70’s, so quite a different feel from what I grew up with. And I love the old cars. Glad to hear you liked it Dave. I have a question about these great BC Road Trip Time Machine films you’ve posted on Facebook (and which have been shared on the Vintage Vernon Facebook page, where I first discovered them). My wife Silmara & I are currently producing a documentary movie short about the classic cinemas of the BC interior called Out of the Interior: Survival of the Small-town Cinema in British Columbia. We’ve done a couple of road trips through the Okanagan, Kootenays, Columbia Valley & Boundary regions, interviewing theatre owners, over the last two years. We also got some pretty typical footage of the highways and roads (and ferries! We’re so happy the Kootenay lake ferry is still free, still great. Thanks. Nice staff, and good breakfast cooked right in front of you, too). However, looking at these road trip films from 1966, we realized how cool it would be to make use of this classic footage. It connects well with our theme, too (nostalgic, vintage experiences at heritage movie theatres), and – especially the ones depicting trips to Penticton, from Kelowna to Vernon, to Revelstoke and from Nelson to Balfour – are the same routes we took last year. Using your footage would really add a touch of class and fun to our project. Not only that, but it suits the form, too…as we’ve shot some of our documentary (including the first trailer) on super 8 film. Your material would really help with the “look”! We are totally independent and produce our short movies and articles in our free time , in stolen moments away from work and raising our family. There’s been no “budget” to speak of, other than our gas, food and motel expenses along the way; so we couldn’t really afford to pay a user’s fee on the footage. We’re hoping you’ll consider letting us make use of no more than 2 minutes worth total (throughout the production) in exchange for a hearty thank you and on-screen credit. We’d be more than happy to display your logo in the end credits and list you as a sponsor (but don’t worry – we’re not asking for money…just use of this classic footage). Our thanks would be genuine, since we still use these routes and roads today, and without the continued excellent work everyone in the ministry does, we wouldn’t have had the wonderful driving experiences we’ve had making this movie. And, with a little luck, we could take the finished documentary on a “road trip road show” through the area again, screening it at some of the theatres we document. (let me know if there’s a specific department or individual it’d be better to address our request to). Thank you very much. Both Silmara & I look forward to hearing from you. Thank you for connecting with us here. Your passion for vintage film and the theatre experience of days gone by is very inspiring! Because these films belong to the provincial government, you are free to use them. We only ask that you credit the BC Ministry of Transportation and Infrastructure in your final work. We look forward to seeing your final product and if you have any other questions, please feel free to contact us. Happy (vintage) trails! Thank you so much for your quick reply to our request, and thanks too for your positive response to our project! We’ll be more than happy to credit the Ministry for the Road trip Time Machine footage we use, and will let you know when it’s done (give us 6 months to a year…we still have some filming to do – one more Okanagan road trip this spring – then the long trawl through the material as editing starts). All the best. Beautiful work. Thanks so much for posting these vintage ‘films.’ I hope to see more of them! And of course the biggest difference of all, the almost total absence of heavy transport trucks and about as many other vehicles than on the quietest day of the year. Just reminds us that the highway wasn’t built or designed for 63 ton B-trains or 44 ton semis traveling at over 100 km/h (and sadly too often driven by inexperienced and time pressured drivers), not to mention summer peak traffic. No wonder the Southern Interior has the highest fatal accident rate in the Province. great video though I wonder what happened to the part from Monte Creek to Salmon Arm? It is interesting to see sections that are relatively the same, and also the many miles that have been four laned over the years (like between Cache Creek and Kamloops). Interesting changes too like not having to drive through downtown Kamloops. There is one significant change – many of the curves have shorter sightlines now because of forest regrowth. Nope, don’t notice much change for most of the way from Malakwa to Revelstoke – still the same two narrow, windy, hilly accident prone lanes. However I expect it will get 4 laned in time for the centenary in 2062 (but only just if the current rate of upgrading continues).